The cottage is situated in an idyllic part of West Wales, which is very close to one of Wales premier surf beaches. Built in 1890 as an Almshouse, with its thick stone walls, and wooden beams the property lends itself well, to a more traditional style of interior design. On entering you are immediately greeted by an open plan arrangement, which makes use of the large bay window and south facing aspect, to create a pleasant ambience of calmness and tranquillity. A fully equipped kitchen and large comfortable lounge with its charming fireplace and log burner, provides the perfect setting to dine on that freshly caught mackerel. Two large bedrooms with double beds and an adjoining smaller child’s bedroom with bunk beds, means that up to four adults and two children can be easily accommodated at any one time. The yard at the rear catches the morning sun and provides a nice place to enjoy your breakfast whilst planning the day’s activities. There is ample room for parking to the front of the property and a grassed area for the children/dogs to play. Just the other side of the hedge boundary is a play park with swings and slides for extra playtimes. Prices are for couples/families only. Additional adults will be charged at an extra rate. Delightful little cottage. Welcome pack of goodies really lovely touch Didn’t realise there was no door between the bedrooms upstairs. So slept downstairs. But was a very comfortable sofa bed. Kitchen well-stocked and dishwasher very useful. Great to have an outside hanging area for wet things. The only downside was that we were not able to eat out in the evening as we were plagued with flies. I think the glass table attracted them. Perfect location for exploring the most southern part of Pembrokeshire. Lots of helpful leaflets left for us to use. The nearby Stackpole Inn is excellent for food. lovely quiet location, good central base, so close to Stackpole, Freshwater West, Lily ponds, St Govans etc. I imagined that we would walk out of the house onto the dunes - not sure where that assumption came from but the local beach about five mins drive was perfect for zoomies with our pooch. the ground floor bed is needs Uncomfortable and squeaky so glad we only stopped for a couple nights.. other than that the house was lovely! Some lovely beaches nearby and close to anywhere else you might want to visit when in Pembrokeshire. Next time we stay we'll book for longer. Just got back from a long weekend stay here. The cottage is in a small village only 10/15 mins drive from Pembroke and a 5 min drive from Freshwater West Beach which is the main reason we picked this location. The beach is great, and vast! We did beach walks and cliff top walks and even when the weather wasn't kind to us it was still worth it for the views - and wearing the dog out! If you have a dog this is a great cottage. Our dog was really settled here and there was a lovely doggy welcome pack for us when we got there. There's also a park just by the house so very handy. There was also some bread, milk and eggs, and welsh cakes of course! Such a nice gesture and really handy for a short weekend so thank you so much for that. The kitchen is lovely - very country cottage - the only thing is the pictures on the oven have warn off so it was guessing that we had it on correctly and at what temperature but other than that lovely. The one thing I will say about this cottage is that as it all flows and is lovely open plan you can hear everything. I personally liked this as you feel connected but I don't think I could have managed if I went with a group. Lovely cottage though and a real homey feel about it. We did try and make a fire as it was a bit chilly but we didn't have enough wood to get it going but I imagine it to be idyllic in winter. We really enjoyed our stay here and would recommend to others going. Thank you for providing such lovely accommodation for our weekend. What a lovely find. We've never been to Pembrokshire before and we fell in love with the area. Every day it's hard to choose between huge sandy beaches, stunning National Trust area at Bosherton and very pretty towns. Being near to the military range was hugely exciting when the army were carrying out their excercises. Visit Cafe Mor at Freshwater West but only open unti l the end of September and then re-opens next year. The best bacon buns. Go to The Stackpole in for excellent food. Our week was the perfect relaxation and get away from it all. You will find yourselves a hop skip and a jump away from the world famous beach of freshwater west, famed for its surfing/kite surfing shipwrecks and extensive sand dunes. As well as featuring in the Harry Potter movie and Robin Hood. The more tranquil Lily ponds and Broadhaven beach near Bosherston are a few minutes drive away. As well as 5 miles of challenging climbing amongst Pembrokeshire’s rugged coastline. Ten minutes inland you'll find yourselves at the beautiful town of Pembroke and the magnificent castle, founded in 1093 and later the birth place of Henry VII where a number of events are hosted throughout the year, including tribute bands, exhibitions, birds of prey, dragons (I kid you not) and much more. Further afield are Pembrokeshires BIG 5 Manor House Wildlife Park, Heatherton, Folly Farm, Oakwood and Blue Lagoon, each offering a fantastic family day out. Half an hours drive will find you in Tenby town where you will find an array of quaint shops, and interesting locations, the Tudor Merchants house is well worth a visit and its neighbours at Plantagenate house have a fantastic menu. There are a variety of family (dog welcoming) pubs The (Bucaneer and Hope and Anchor are amongst our favourites) which serve some wholesome home cooked meals with fresh produce ie.. mackerel, bass, and The Caldey Crab. The boats to Caldey island run daily from May to September (except Sunday) from the idyllic Tenby Harbour (weather permitting) and is one of the most tranquil experiences, men can visit the monastery and mum can take the kids to The Chocolate Factory, visit the light house and admire the Pembrokeshire coastline from a birds eye view. 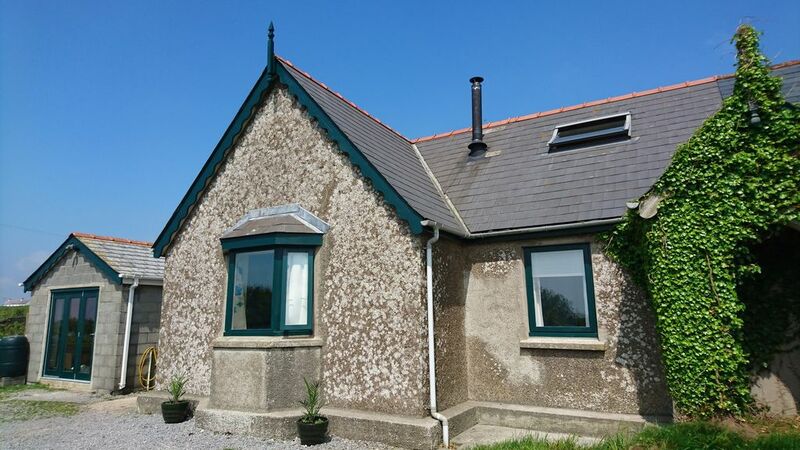 Whether your looking for an adventurous action packed holiday or a more sedate relaxing restful time Fresh beach cottage could be the perfect place for your stay in Pembrokeshire. Please feel free to contact me for any more information should you require it. Prices are based on a family basis. Additional adults are charged accordingly. Please ring before making a booking. Thanks Caroline.